This is a picture of a room being cleaned. 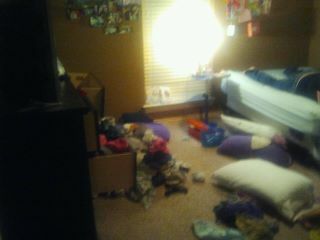 Notice the clothes are pulled out of the drawers and the pillows are on the floor. Someone has gone through and dumped every thing out of the dresser. This is a great way to clean a room because you can sort through each item making a decision to keep, trash, or recycle. Notice the child on the bed who is tired of looking at the mess. I think she is hoping someone else will come clean up for her. Many times the center of our lives looks like this picture. We have piles of "junk" stored in the deep creases of our heart. We have allowed the world to conform us to its ideas and behaviors. We seek approval from people. When we receive a little praise, we store the compliment deep without heart, striving, searching for more. We live for appearance and we judge others on their appearance. We hear criticism toward us and anger arises within us. We store bitterness and anger deep within our hearts. We take our sin that we enjoy for a season and we stuff the guilt to silences our conscience. In other words, our drawers are full. Do you understand this is why Jesus came? He came to sort through and clean up our overflowing drawers (our lives). Our lives are a mess. Some of our messes are by our choosing and sin. Other parts of our messes are due to others choosing and sin. We are a dirty and messy (sinful) people. We need help. Remember the child lying on the bed hoping someone would come clean up the mess. She has someone. His name is JESUS. Jesus did not come to tell us how to clean up the mess. He came to clean up the mess for us. We are desperate. Can you really clean out your drawers apart from Him. Christ is your deliver. We are great sinners. The junk is spilling out of our lives. Christ is the great Savior. He came to set us free from slavery to sin. He came to set us free from self-righteousness (cleaning the drawers apart from Him). He came to set us free from the burden to be perfect. He liberates us from needing the approval of people. He delivers us from anger and guilt. Christ is perfect and we take on His righteousness. When we confess our drawers are full (sin) and surrender our lives (realize there is nothing we can do to fix our sin), Christ Jesus comes in saving power. He not only cleans out our drawers, He gives us a new dresser with freshly folded clothes of His righteousness.